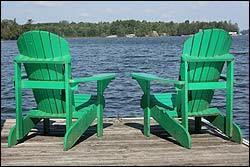 August 2013: Tips, eNews & More! We hope you are enjoying the relaxed pace of the summer, and at the same time getting out and taking advantage of the activities that the season brings. Have you been involved in a group sport this summer? With the season winding down, now is the time to look for an indoor activity for the fall. If your choice of sport involves contact or strength and balance, talk to us about a custom fitted mouth guard. Above and beyond the benefits of safety and protecting your smile, some mouth guards have been shown to improve your overall sports performance. Are you or a family member headed off to school in September? 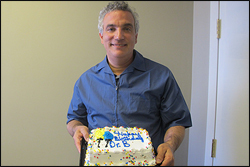 Dr. Benedict celebrated his birthday this month. We had a little surprise for him, including this birthday cake. Don't worry, we brushed & flossed as soon as we ate our cake. The extensive renovations are almost complete! 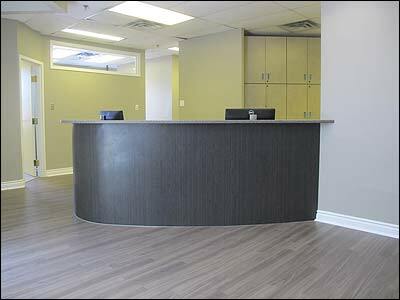 We updated our dental office with a new reception desk, new sterilization centre, new floors and paint throughout. 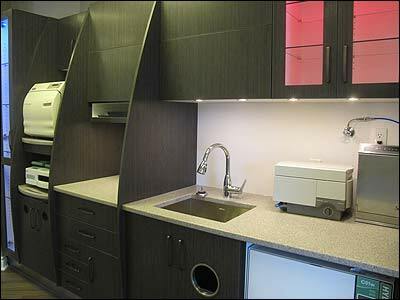 We also have added a beverage station where complimentary coffee, hot chocolate and water are available for your enjoyment. In addition, we listened to your suggestions and we now have cable TV in each operatory. We appreciate your patience and look forward to all of our patients seeing our office "makeover". Come by our office to see the amazing results. We would love to hear what you think! Click here to see more photos. On Wednesday August 14 we held our 7th Annual Sports Mouthguard Clinic. Thank you to everyone who came out and made this event a huge success! We had so much fun and hope you did as well. A donation will be made to KidSport West Northumberland. Sedation Dentistry allows us to care for your oral health needs, while you are relaxed, under supervised sedation. Sedation Dentistry can be used for patients with dental anxiety or other conditions. Looking for an awesome campfire treat... try this Campfire Banana Boat recipe. Not camping? They can also be made on the BBQ. You can also mix it up with different flavoured cookies and chocolate chips. Click here for the recipe. Let us know what you think.